This volume presents a systematic review of interprofessional education in health and social care. 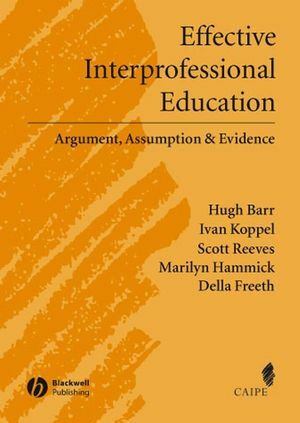 This is accompanied by a wider-ranging critique of interprofessional education, grounded by experience, and informed by sources beyond the evaluations that qualified for inclusion in the review. Synthesising the evidence base for interprofessional education nevertheless remains central, with 353 studies surveyed in the first instance, from which 107 studies form the basis for the final analysis. The book does much more than amass evidence. It revisits conventional wisdom; setting an agenda to help interested parties perform better by applying lessons learned, remedying weaknesses and renewing efforts to address unanswered questions. The first three chapters set the scene for the systematic review and its findings. The middle section of the book articulates the findings of the review. Finally, the closing chapters consider values and attitudes, theoretical perspectives and offer conclusions. Arguments, assumptions and evidence in this publication are presented to inform policy making, programme planning, teaching and research. Foreword by Dr Gerard Majoor. Foreword by Professor Madeline Schmitt. Learning to work under pressure. Capturing interprofessional education in essence. "In summary, this book is a valuable resource for anyone already involved in interprofessional education and for newcomers to the area. It provides a clear picture of the current position of IPE and offers a sound framework for future development." "The authors have succeeded in synthesizing the evidence base for IPE and in so doing have established a knowledge base related to good IPE past and present programs. That accomplishment in itself is laudable; but the authors also have gone beyond that accomplishment and challenged the field to do better… and in the process have provided a blueprint for doing so." "Easy to read and a valuable resource to policy makers, program planners, team leaders, teachers and researchers"